Photodynamic therapy (PDT) is a two-step therapeutic technique in which topical or systemic delivery of photosensitising drugs is followed by irradiation with visible light with an adequate emission spectrum and irradiance. Activated photosensitisers transfer energy to molecular oxygen generating reactive oxygen species (ROS). The subsequent oxidation of lipids, amino acids and proteins induces cell necrosis and apoptosis. In addition, ROS indirectly stimulate the transcription and release of inflammatory mediators. The low light dosages can trigger only photochemical reactions without ablative photothermal effects. All the photosensitisers are selective, i.e. they penetrate and accumulate in tumour cells or in the endothelium of newly formed vessels while relatively avoiding the surrounding healthy tissue. A strong interest for PDT in dermatology was raised only in the 1990s by the availability of a simple and effective technique: the topical application of aminolevulinic acid (ALA) and its methyl ester (methyl aminolevulinate, MAL) followed by the irradiation of broadband red light. These drugs do not induce strong generalised cutaneous photosensitisation like the systemically applied porphyrins or their derivatives. For dermatological purposes incoherent lamps or LED arrays can be used for light activation. PDT is used for the prevention and treatment of non-melanoma skin cancer. 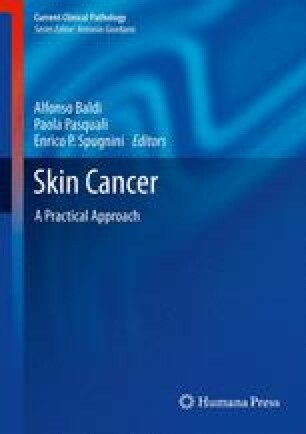 Clinically approved indications have been restricted to actinic keratoses, nodular and superficial basal cell carcinoma, and, since 2006, Bowen disease. Treating superficial oncologic lesions, cure rates achieved by PDT are equal to the cure rates of the respective standard therapeutic procedures often with better cosmetic results.